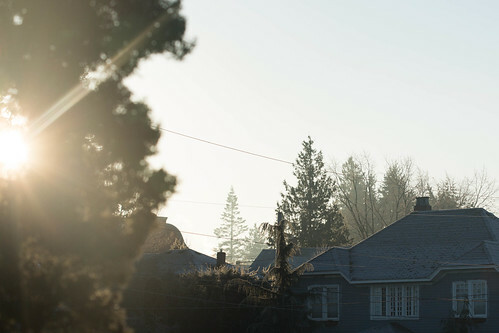 Here’s to a bright and better new year! As we often do, we stayed in and had all the Traditional Foods of the season. 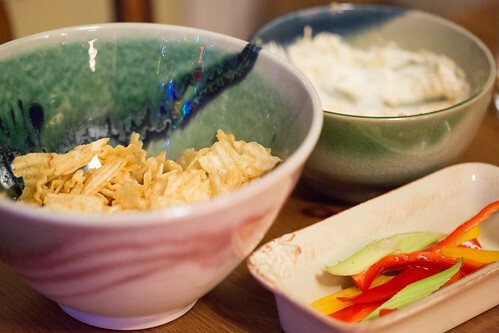 First, on New Year’s Eve, there was the chips and dip course. This year I made a variation of the America’s Test Kitchen caramelized onion dip, and it was pretty good, although still a bit too sweet. We ate more vegetables with it than usual, since I ended up with vast quantities of crudites after a catered event last weekend. And there had to be oysters. 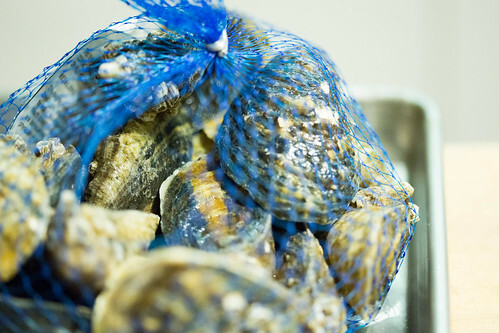 We went out to the Taylor Shellfish farm store in the morning and stocked up. 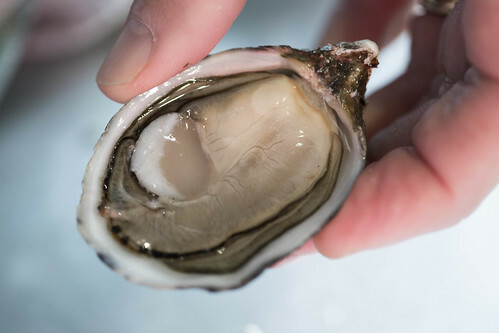 First we demolished a bag of tiny Olympias, then moved on to some enormous, beautiful Shigoku oysters. With bubbly, of course. 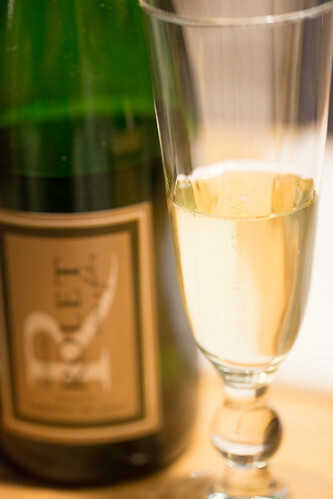 This year our bubbly was a Cremant du Jura. It actually got better-tasting as it warmed up. 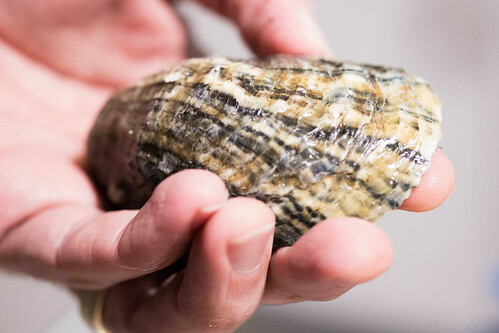 We bought it at an oyster-eating event a month or so ago and it really is great with them. And, as always, good luck noodles. Earlier in the day I roasted a half duckling, picked the meat off the bones and made stock. 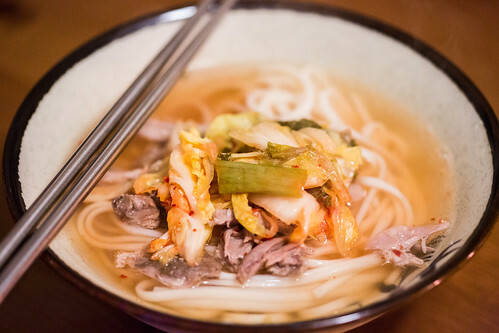 I cooked udon noodles and served them with a bit of duck meat, the duck broth, and a big helping of homemade kimchi. Absolutely fantastic. The only down side to our New Year’s Eve was the discovery that our pup is deeply afraid of fireworks. She spent the evening shivering and drooling, and curling up against my ankles whenever I was standing still. It was awful. Although it was pretty funny when she decided that sitting on Jon’s lap would be a comforting thing to do. 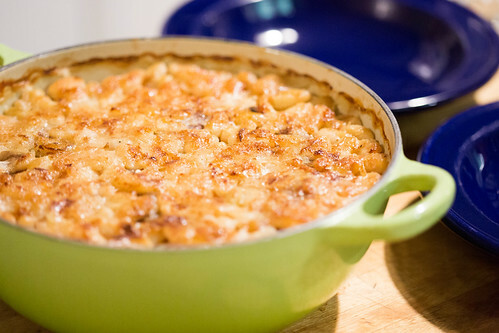 On New Year’s Day, after a long walk with the dog to try to release her nerves, we finished off the oysters and potato chips and started work on the cassoulet. I had a couple of bags of cannellini beans in the freezer that I shelled last fall, so I cooked those with a ham steak from our new pig, some sweet onion and bay leaf. Then I layered the beans with the rest of the duck meat and a few softly spiced sausages from our co-op, poured the rich bean broth over and baked it in a low oven for two hours to develop a good crust. 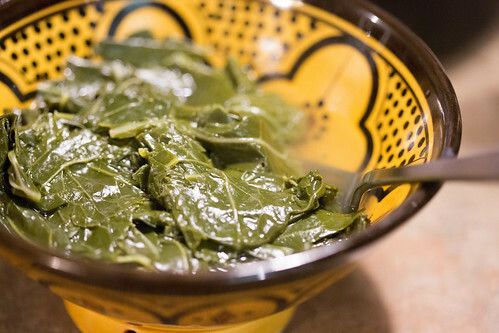 To go with the cassoulet, I picked a different New Year’s tradition and made long-simmered collard greens. 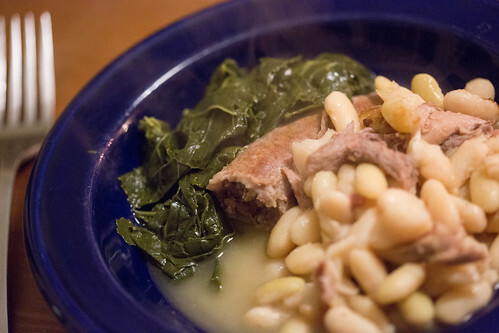 I didn’t feel like I had enough greens to be worth getting out a whole ham hock, so they weren’t as flavorful as I would have liked, but they made a good foil for the rich porky beans. 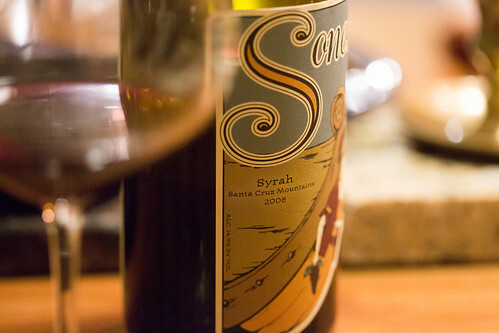 A bottle of our favorite California Syrah went gorgeously with all of it. Our year is pretty well kicked off. Here’s hoping it’s a good one!